Split Outlook OST file into smaller PST data file with OST file Split tool. 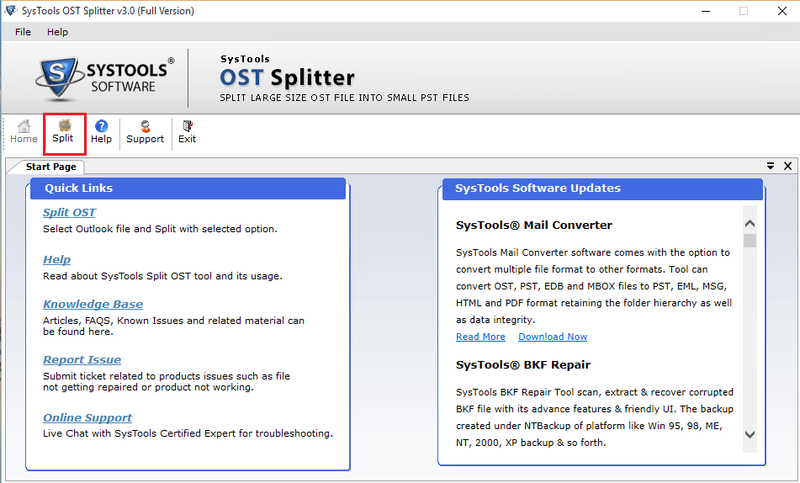 Provides extensive flexibility to divide large ost file using Split by Size option. Allows to Split OST file by enacted Split by Date feature. Repair Outlook OST file prior to split into small PST files. OST Splitter enables you to split ost data by specified year. Outlook Installation is necessary to divide ost data into small chunks. With the help of OST Split Software, you can easily break large Outlook OST file, Which is the major reason for the corruption of Outlook OST data. Offline OST break software performs division of ost data in the simpler manner without loss of any data. 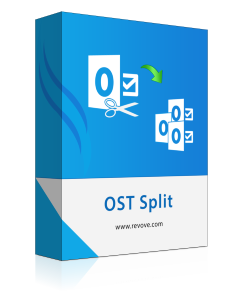 OST Split tool provides the functionality to create the single file for each folder in ost file. When using Split by Folder option, Software automatically formed the separate file for the different folder inside the OST file. Thus facilitates you the effective management of OST data file after the completion of OST Split process. 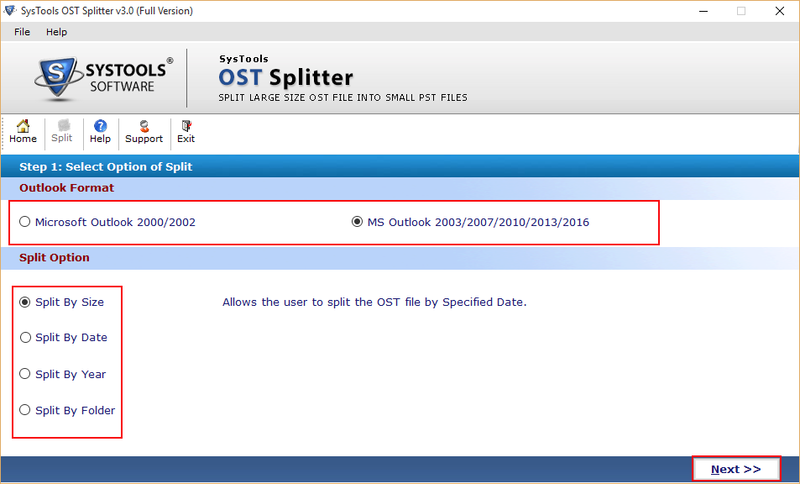 The Outlook OST Split Software provides the enhanced feature to divide the OST data file within the Specified Year. When you are using these option, then a single file is created for each year which falls in the specified year limit. For example, If you have chosen the year from 2010 to 2015 then Six different files are created for each specified year. With the help of Split OST File by Date Option, you can easily break ost data file into two different files. The OST File Data Splits according to specified date such as the date before the chosen date is saved in one file and data after the date is saved in other files. OST File Splitter Software provides the advanced functionality for defining the size of OST to break down OST file into smaller chunks of PST file. You can select the size from 5MB up to 45 GB exclusively. The Divide OST file tool support ost data file of Outlook versions 2000, 2002, 2003,2007, 2010, 2013, 2016 respectively. The OST file split software allows you to save resultant file at desired location. The software also allows you to create the new folder using the software panel itself. You can also use the Exclude Deleted Items to prevent stale data from being split into smaller pst file. 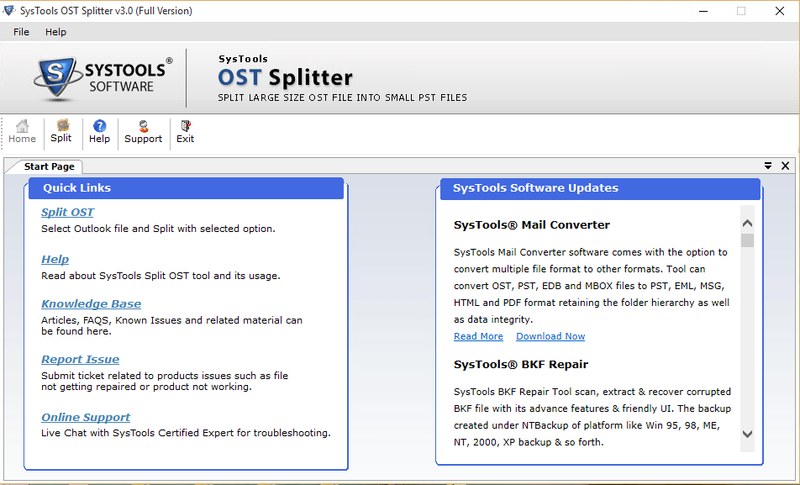 The Demo Version of OST File Splitter Software allows only to split first 50 items of ost data file. Hard Disk Space: 20 MB of free hard disk space. Can I use OST File Splitter Software to Split corrupt Outlook OST data file? No, You cannot use software, when the OST file is corrupted. You have to repair prior to the split. How can I split large OST into smaller parts? You can use Split by Folder Option to split ost folder into the separate pst file. Is there any limitation imposed by the software on OST file to split? No, There is no such kind of limitation imposed by the software on OST file. However, there is the limitation imposed by a demo version of the software. I have been using Outlook connected with Exchange server since 5 years. Recently, I archived the OST file to use it as the backup in data catastrophe. But there was problem disturbs me that Large Ost file gets corrupt easily. Therefore I was in continuous search of Software that can easily split archived Outlook OST file. Then Luckily, I found Split OST Software. It easily split my 25 GB of OST file. Thanks for such innovation driven software. 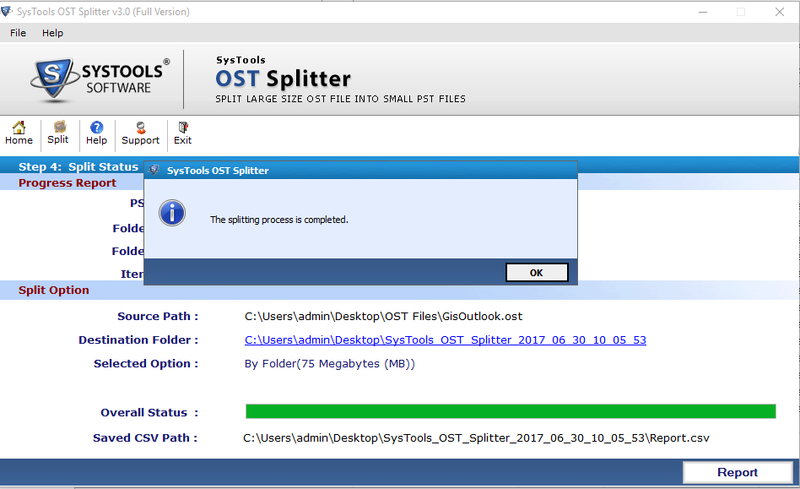 With the help of OST File Splitter software, I successfully split 30 GB of OST File. The Graphical user interface of the software is so simple to operate that even peoples like me easily use it to split ost file. The Support team is smart enough to tackle down the installation issues when I was trying to install software on Windows XP. Thanks to support team to being there to help me.